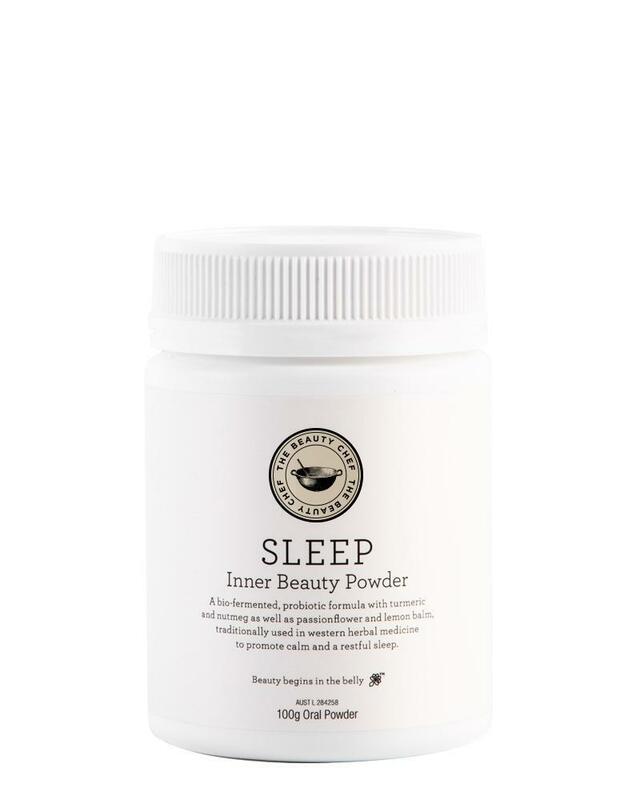 The Beauty Chef’s SLEEP Inner Beauty Powder is a delicious, multi-tasking nighttime tonic that helps combat sleeplessness and relieves mild anxiety symptoms while boosting antioxidant activity and nourishing your gut and skin health. As the name suggests, SLEEP is scientifically formulated to soothe your nerves and deepen your sleep. The formula contains natural sedatives, passionflower and lemon balm, alongside sour cherry – naturally rich in the sleep-giving hormone, melatonin. 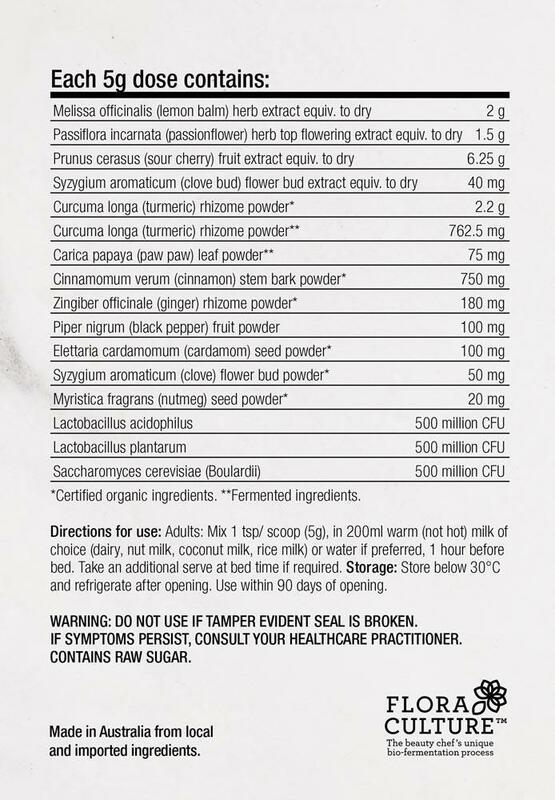 With bio-fermented pawpaw leaf and turmeric root and a natural broad-spectrum probiotic per serve, the formula is supercharged by The Beauty Chef’s exclusive Flora Culture™ fermentation process, for greater potency and absorption. It’s a therapeutic medicine – made with organic and natural ingredients and has been granted ‘Listed Medicine’ status by the Therapeutic Goods Administration of Australia. Promotes a good night’s sleep – along with the natural sedatives lemon balm and passionflower, it contains sour cherry which is naturally rich in melatonin. Soothes anxiety – lemon balm and passionflower help relieve mild anxiety symptoms, nervousness and restlessness. Promotes nutrient absorption – the turmeric root, pawpaw leaf and other superfood ingredients are bio-fermented using The Beauty Chef’s exclusive Flora Culture™ process for greater potency and absorption. Fights premature ageing – bio-fermented turmeric is rich in antioxidants that helps fight free radicals linked with premature ageing. Helps restore good gut health – contains bio-fermented turmeric and pawpaw plus a natural broad-spectrum probiotic per serve to re-balance your microbiome while you sleep.